Does your network offer the ability to scale quickly? Engineering company Aerison had signed a long-term contract with a major telecommunications provider for network and data center co-location, but it did not offer the ability to scale rapidly. As a result, the company chose to implement a new IP WAN and Cloud platform by Vocus—a high performing, cost-effective network and business system support, that provided the ability to scale quickly in response to new projects. 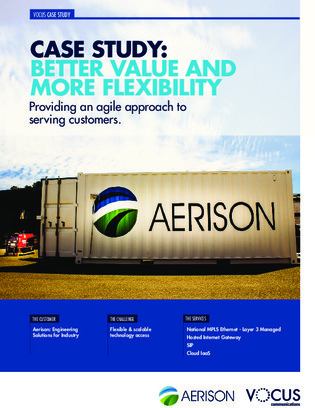 Download this case study to learn more about Aerison’s upgrade.